Our trip to Alabama was really fun. We had programmed the GPS to his office in downtown Centreville and it guided us there unerringly. I’m fairly sure we never would have found it otherwise. This is RURAL, RURAL Alabama – about 20 miles from Tuscaloosa – lots of two lane, mostly unmarked roads so we were totally reliant on the voice in the box. We went by Si’s trailer and reintroduced ourselves to his dog, River and turtle, Tony. He’s on a small lake that’s loaded with bass and catfish and is about 100’ from his door to the water. What more could you ask for? We had a family style barbecue at Big Daddy’s and then got to our hotel in nearby Vance. The big surprise was that this place is in the middle of nowhere, and I do mean nowhere, except that it’s sitting behind a new Mercedes manufacturing plant. Incredibly large and must employ thousands. Until we saw the plant, I had my doubts as to what kind of a place would be this far out in the woods. I’m sure 99% of the guests are visiting Mercedes. Very nice accommodations. I think we were both asleep before it got dark. The small town and county where Simon presides as the Extension Agent has an annual lily festival to honor a particular variety that only lives locally in the Cahaba River. The river runs through a National Wildlife Refuge and we got to experience it all. There was a formal program which included several Alabama political figures, a Botany professor from Samford University who is the worlds foremost (and perhaps only) expert on this particular lily, and a presentation by Simon describing current and future 4-H programs. There was a luncheon which consisted of 3 long tables full of home made dishes – a pot luck kind of meal. There were probably over 100 people, maybe double that, but trust me, they had way more than enough food. You wanted to take a spoonful of everything just to try new things. We met his co-workers and others in the community who know Simon and listened to nothing but accolades of his work and how much they appreciate him being there. Many of the folks are close to our age and treated him like their own grandson. It was amazing to me how easily he fit into such a different environment. We hit another of his favorite restaurants for dinner Saturday night and then breakfast on Sunday with Amy, his lady. Funny story on the Sunday breakfast – we made arrangements to meet them at a restaurant called the Sawmill – at least we thought it was the Sawmill – and programmed the GPS to guide us there. When you say “sawmill” in Alabamese it sounds like Saw-meal so you can imagine our surprise when before we got to the place, we passed a restaurant with a big sign that read SawMeal. What made it most confusing was that the GPS still had it two miles away. Should I stop at the Saw Meal or drive on looking for the Sawmill? Let’s just stop here and call Simon. Oops, no phone service. We are in RURAL Alabama. So we decided to just hang there at the Meal and hope we spot Simon either at the SawMeal or driving past to get to the Sawmill. We were early but they pulled in exactly on time. Highlight of the return trip was breakfast/lunch at a place in Gainesville, the Flying Biscuit. I’m a bit of a biscuit Nazi so I couldn’t resist. Unquestionably the best biscuits I’ve ever eaten – and that’s a big deal for me. We bought a dozen to bring home and freeze. They’re still good albeit not quite as good as right out of the oven. Quick garden highlights – Nematodes got the cucumbers; acorn squash made it for the first time in 10 years of trying; more green beans than we can possibly handle ourselves; picking cherry and plum tomatoes; cut down most of the collards and all the Tuscan Kale-bolted – sprayed the corn with Neem after finding some critters lunching and munching on it. Some really strange things going on in the tomato patch. I had a lot of trouble getting seedlings going this year – think I’ve found the problem and corrected it – so I started taking care of renegades that popped up in the garden as a possible salvation in case none of my new plants made it. Over the years I’ve planted literally dozens of varieties and hundreds of plants. Invariably some tomatoes fall off the plants and those seeds go into the soil accordingly. Or if a caterpillar drills into a tomato and makes it undesirable, I pull it and pitch it into the compost pile. That plus when I end the tomato season I pull out the old plants and deposit them in the compost pile. There are usually a few rotting tomatoes clinging to the old vine so those seeds are also buried in the compost. Every few months I move the compost from the pile into the garden – no doubt moving some of those seeds as well. The net of all that is that in the spring, from about March thru now, many of these seeds germinate and pop up as “weeds”. Since they’ve probably been cross pollinated with who knows what variety, the children are of mixed heritage. You never know until they start to put out tomatoes just what you have. In a good year when all my desired seedlings have made it, I just pull out all the renegades. One of these Strangelings appears to be a cross between a cherry and a San Marzano. Can’t wait to see how that works out. One of the scourges of the garden, and specifically with the squash/zucchini, has been aphids. At the start of the season I read that planting nasturtiums would keep the aphids away so I decided to give it a test. I put in the flower seed amongst the squash plants and sure enough, I’ve had no aphids this season. It may be just the particulars of this season but at this point I’m giving the credit to the nasturtiums. Plus they dress up the garden a bit. You probably know that cucumbers are in the same family as squash or at least they look like they could be related. They are planted in the row adjacent to the squash so may be also getting the benefit of the nasturtiums. As you can see, the cuc’s are coming on strong. This is one plant so you can just imagine what the crop from the six I planted will be. I did stagger plant so hopefully it’ll be a long, productive season. This particular variety is hands down my most demanded crop. Everybody we know asks when the cucumbers are coming. I have a feeling the on bush count will drop dramatically while we’re in Alabama. It’s Florida corn season and we saw an ad on the tube talking about ricotta corn fritters. The corn in our garden won’t be ready until mid June but we decided to buy a few ears on sale at the market and make a batch of fritters so when our own corn comes in, we’d have another way to use it. I googled “ricotta Corn Fritters” and the recipe popped right up along with one entitled Ricotta-Corn-Zucchini fritters. Since we still have a long position in zucchini and always on the lookout for a new way to use them, we went in that direction. Really, really good. We halved the recipe and still ended up with 6 fritters about 4-5” across. Also learned something. The recipe called for a small capsicum chopped. I had no idea what a capsicum is and planned to just skip it but as long as I was googling, I searched capsicum. Turns out it’s a variety of pepper that longs like a regular green or red bell pepper to me. Just happened to have one of the regular varieties so the only ingredient we ended up omitting were some chopped chives. Whatever! Can’t wait for our fresh corn to start happening. It’s blueberry season in Florida. We have a great U-Pick place a few miles from where Nancy plays bridge so it’s convenient to load up during the one month season. We bought 15 pounds this first time – which was all he had picked and we’ll probably repeat that for the next couple of weeks. Last year we simply didn’t load up enough so we’re determined not to make that mistake this year. The main use is with cereal in the morning but some end up in muffins along the way. I wonder about putting a few handfuls in the next batch of zucchini bread. FYI – 15 pounds packaged into 13 quarts. 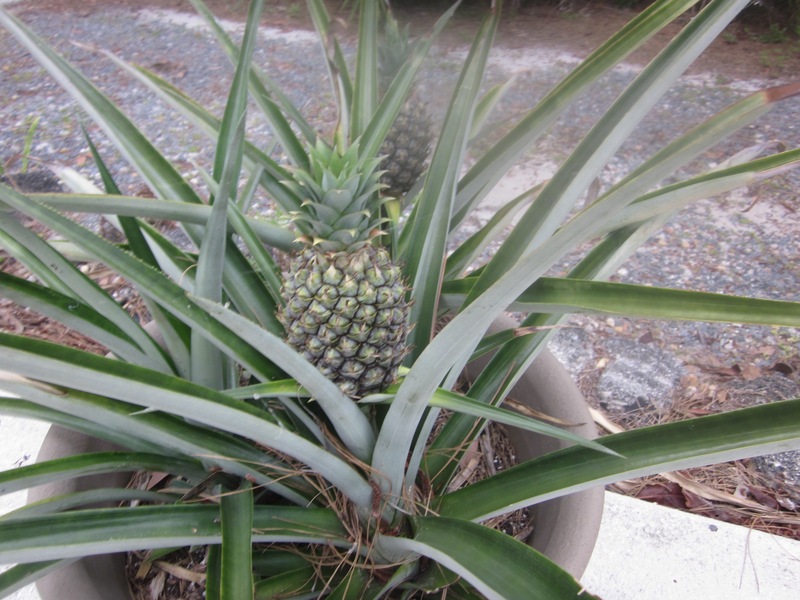 Catching up – the pineapples are still growing nicely. My guess now is that we’ll be harvesting a couple by the end of the summer. Picking green beans – gobs and gobs of green beans. I’m going to try my best to keep up with them and pick them while still tender. Bean plants will keep putting out as long as you keep them well picked but they grow so fast that it’s easy to get behind and watch them go tough. I’m growing bush beans this year instead of pole beans just to give the trellis area a season or two of something else. 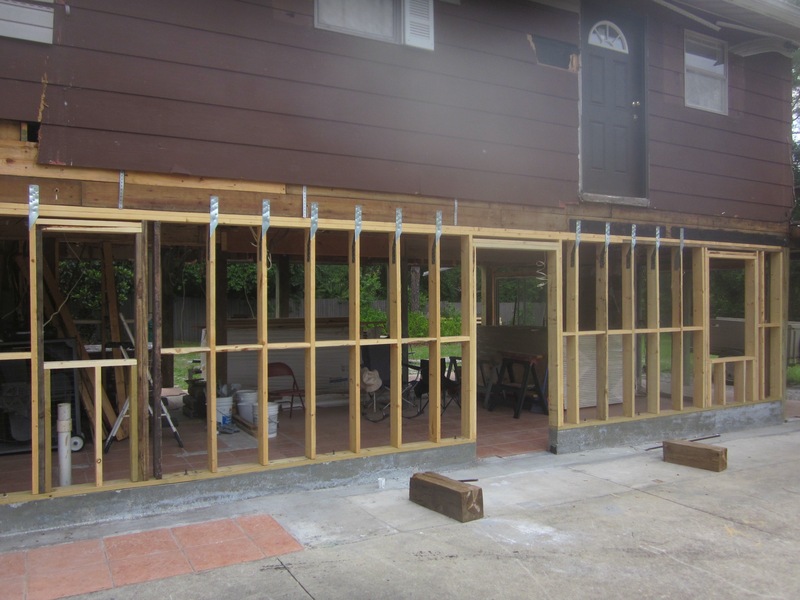 My neighbor’s house rebuilding project is moving along, slowly but surely. The entire downstairs exterior has been framed, the 8”x8” support poles have been replaced and a concrete stem wall poured and finished. If you look closely at the picture you can see where windows and the front door are framed in. All of the support jacks have been removed so it’s standing on it’s own. Another pizza masterpiece. I’m turning these into works of art. A couple days ago we bought a hand held kitchen tool called a Veggetti maker. This takes veggies such as zucchini, carrots, potatoes, beets etc and cuts them into spaghetti like spirals. I decided to give it a flight test with a small zucchini – certainly no shortage of those. Broke out a jar of Nancy’s spaghetti sauce and added a couple large chard leaves cut into strips and the small zucchini cut into spirals with the new gadget. Heated it for a few minutes – not cooking it, just heating it. Added some sausage and poured it all on a store bought multi grain pizza shell. Topped it with mozzerella and popped it onto the Holland grill. In 10 minutes it was on the table. We both had some reservations about this combination but it was a total winner. I had made one a few weeks back that incorporated thin slices of zucchini and that was good but this new way to prepare the zucchini was even better. I can see where just the spiral cut zucchini with sauce poured on it would be a great side. Rookie mistake. I didn’t put on any face/lip sun protection at the beach. I always do but this time the tides were such that my back was to the sun when surf fishing and it was cool and breezy. Traps. My lips were so burned that they swelled, blistered, split and bled big time. I’d wake up in the morning and my face was literally covered in blood. Truly miserable for the last few days but a combination of cold compresses, aloe strips, and some new lip repair product recommended by the pharmacist at Walgreens has it about beaten. I sure won’t make that mistake again. We had a great Mother’s day with Tom, Tina and Olivia, Joey, Mark, and Mark’s mother. Tom came up to the lake to pick us up and we went to our favorite meet up spot on Rose Bay, Hidden Treasures. The food is always good, the prices reasonable and the views and atmosphere are unbeatable. The service could be better but it’s so enjoyable just sitting out on the water watching the natural events unfolding, that the waiting is just fine with me. They serve up drinks quickly and check on them often but then slow things down – I think that’s part of the business plan as opposed to bad management. I think they’d much rather have you sit there slurping down exotic drinks than eating. A fair percentage of their business comes from boaters who pull up to the dock and disgorge more customers. I met a new neighbor up at the mail box/newspaper drop the other morning. I was retrieving the paper and looked up the road to see a major league large dog heading my way – about 20’ away. It was waist tall so it could have been a serious predicament but I could tell by the way he was bouncing along, supporting a big dog smile, and wagging his giant tail that it was probably not a threat. Still my heart was pumping overtime. He came right up to me and nudged his head under my hand asking for a pet as best he could. There was no misunderstanding his attention so we had a nice meet and greet. It had a good collar and was clearly a valuable blood hound. He walked with me a few feet and then wandered off in a different direction. I later learned that he lived a few houses down. We’ve made zucchini bread so often that we have the recipe memorized. For future reference, each loaf uses a cup of shredded zucchini and one of the giant zucchini’s yields 4 cups. In the latest case we made 2 loaves of bread and used the other two cups of zucchini to make zucchini patty’s – sort of like potato cakes without potatoes. One of the three plants is cratering – gave it all and the other two are a few weeks behind. We had such good success that I’m thinking about trying again in October. I’ll wait and see what the weather looks like and how voracious the critters have been. There was a fairly strong easterly wind all day Sunday and overnight so the surf was much rougher and the tide higher on Monday morning. It still looked fishable so I gave it a try, switching from mullet to shrimp for bait. Nothing. And the reason you’ve not been flooded with big fish pic’s is that the fishing remained poor until Thursday. Caught lots of fish Thursday but nothing worth taking pictures. So this week has been lots of eating out. We’ve hit all the favorite haunts – Wacky Wing Wednesday on the pier, Fish and Chips at the Golden Lion – and a few brand new ones – Hidden Treasures, Metro Diner and Beach Burgerz so we’re running out of days before we run out of places to try. On Tuesday Joey came up and we drove to St. Augustine to try a landmark shrimp place – O’Steens. People have told us about this place for years but all cautioned that it could be a wait of a couple of hours which is a large turn-off for me. Then someone said that next door to O’Steens was a British Pub and that if you signed up for O’Steens they would page you at the Pub when your table was ready. As it turned out the wait was only 15 minutes. The food was very good but I wasn’t hungry and decided on the Majorcan (spelling?) clam chowder. Really, really good. Tom came up Friday and we hit our favorite burger joint – the Turtle Cafe. This is one of those places with a menu to satisfy every taste but a place that you would absolutely drive right by without a second thought if you didn’t notice the number of cars parked along the road on both sides of A1A and the number of people just mulling around outside waiting to get in. Lots of catch up gardening. The zucchini had grown to football size so designated for cattle feed and/or zucchini bread. Transferred sweet potato slips from the water jar on the window sill to the garden. I planted 4 slips and have about twice that many ready to go depending on how the first ones survive. Sweets are a 90-100 day crop which makes it an August harvest, one of the few things that can handle the August heat. I did lose quite a few seedlings – mostly peppers and eggplants – but since these guys do so well in the summer heat, I’ll be able to plant some seeds and still get in a decent crop. Pulled out the last of the winter peas, the last of the kohlrabi, cauliflower, broccoli, and cabbage. A few baby cucumbers started while we were gone and should be pickable within a couple of weeks. There are 6 plants and hopefully they will produce until late June. They are somewhat like zucchini in that if you don’t stay right on top of them, they turn into footballs but unlike zucchini, they are easily distributed to neighbors and friends. The other thing that thrived in our absence was green beans. The plants are knee high and loaded with blossoms so we’ll be doing beans in a couple of weeks. I’ve been stagger planting beans to extend the harvest and the ones with blossoms are the first planted. All of this harvesting is fostering some kitchen togetherness for Nancy and I. She has trouble reading some of the recipes or lifting things so I’m involved as an intern or apprentice basis. Today we made zucchini parmesan, roasted cauliflower soup, and 3 loaves of zucchini bread. I made a great catch today. We put the loaves of zucchini bread in the oven and I went out to dig around in the garden. I came in and found Nancy sound asleep on the couch and just as the beeper went off on the timer, signaling the bread was done. Save! !